More and more Canadians live in urban centres, and they are confronted by a increasingly complex range of problems – unemployment, urban sprawl, aging infrastructure, safe drinking water, and food security. Community leaders are looking for practical advice, concrete strategies and critical reflection on the alternatives. The Centre for Civic Governance, an initiative of the Columbia Institute, works to strengthen Canadian communities through sharing best practices, providing tools for locally elected leaders, and progressive policy analysis. The Centre has published five books in the Going for Green Leadership series. The most recent volume, Resiliency: Cool Ideas for Locally Elected Leaders was launched in Saskatoon on November 23 at McNally Robinson Booksellers. This is a positive, upbeat book that moves beyond simply identifying the problems to finding ways to address them. All the communities mentioned in the book are Canadian, and they range in size from large cities, such as North Vancouver and Toronto, to small communities, such as Williams Lake and Swift Curent. 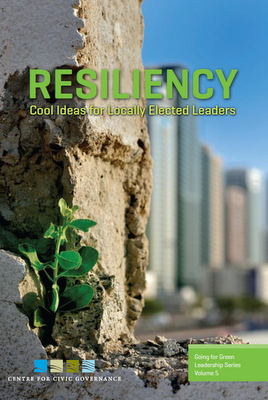 The first chapter is a big-picture look at resiliency, its strengths and weaknesses, by Dr. Bill Rees. The following chapters look at urban design, economic challenges, leadership tools, and ideas whose time has come. Cities in Transition Ryan Walker, a professor in the department of Regional and Urban Planning, University of Saskatchewan, looks at prairie cities, such as Saskatoon, which have the potential for dramatic transformation rather than incremental change as they confront social, demographic and economic challenges. Surviving and Thriving at the Council Table Donna MacDonald, a long-time city councillor in Nelson, BC, provides tips for working effectively with other elected officials and community members. The Craik Sustainable Living Project Reeve Hilton Spencer and Mayor Rod Haugerud were looking for ways in which to maintain viable rural communities. “The rural municipality had 120 acres that we weren’t really using too much, and I thought, well, if I could get ten people to move to Craik that would be an historic step,” explained Reeve Spencer. Step by step, they formed the Craik Sustainable Living Project. Public Participation in Resource Management Laura Bowman, staff counsel at the Edmonton Environmental Law Center, provides an overview of the legal tools that are available to help communities ensure that there are adequate regulations in place as resource-extraction businesses move to the prairies in growing numbers. The Case for Watershed Governance Murray Ball, founder of the North Saskatchewan River Basin Council, takes a look at the emerging water issues on the prairies and recommends participation in stakeholder-based watershed protection initiatives and experimentation with alternative treatment options. Swift Current’s Source Water Protection Story Arlene Unvoas, from Swift Current Creek Watershed Stewards, discusses the key players, initiatives, and the keys to long-term success of community-based watershed protection groups. Tipping Points: What Lies Ahead?